The Earliest 16th-Century Monasteries on the Slopes of Popocatepetl are 14 monasteries near the Popocatépetl volcano in central Mexico which were built in the 16th century by members of the Franciscan, Dominican and Augustinian orders. They were a major factor in the Christianization of a very large population over a vast territory and in a short period of time. Out of the 14 designated locations that comprise this WHS, I visited the former monasteries of Cuernavaca and Tepoztlan. The one in Cuernavaca is attached to the Cathedral, but I had some trouble finding it. The cathedral lies within an enclosed area, with two pretty chapels at the corners and its own interior shouldn’t be missed either. The early 16th century remains were hidden behind a party tent, and consist of nothing more than a simple altar and indeed an “open area” for the indigenous people to stand and listen. It’s attached to the main cathedral, which seems to be part of the WHS as well. This church is well worth a look, as it is a mixture of modern features with old wall paintings in the nave that are mentioned in the AB evaluation. On my last day in Mexico I went on a day trip by local bus from Cuernavaca to Tepoztlan. It’s a ride of only 45 minutes, but the town is situated much more nicely in the mountains. No views of the Popocatepl though. The former monastery here is easier to find, as it is both a lot bigger and signposted. Entrance is free, and they’ve turned it into a museum annex exhibition space for local artists. Explanations are given via information panels in each room, but only in Spanish. The hallways of the monastery are completely covered with red and black murals which is very pretty. It also has characteristic crenellated walls. The open chapel nowadays seems to be used to store paint! Tepoztlan itself is a pretty little town with a vibrant market. The no. 1 attraction however is “The Pyramid” a very late (1502?) pre-Hispanic remain in a secluded location as if it was Macchu Picchu. It’s a strenuous hike of 2 km uphill, all stairs. I finished it in 50 minutes, but the views from the top were worth it. It was interesting to get to grips with why the monasteries look like they do, and it reveals a story about the early relationship between European and indigenous populations. We only managed to visit two sites but this felt sufficient to gain an understanding. 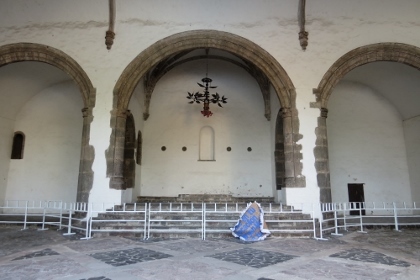 The monasteries are arranged around courtyards, it seems this illustrates European adaptation of indigenous religious practice which for the main congregations normally took place in the open air. It also meant that more people could attend masses. Whilst travelling around I listened to this episode of A history of the World in 100 objects, and whilst it doesn't directly relate to one of the listed sites it gave me a very good introduction to the concepts that make these places of outstanding universal value. Not for the first time on our trip we ended up unknowingly following in Els footsteps. Our first stop was the Cathedral in Cuernavaca, which I found to be rather magnificent. The huge paintings on the internal walls were wonderful, and well complemented by the modern decorations and details inside. Cuernavaca itself was also a worthwhile place to explore, especially the town hall in Cortes' former palace, with a balcony covered in magnificent Rivera murals telling the history of Mexico. The only other monastery we visited was in Tepoztlán, buried in the heart of this interesting town the same courtyard layout could be seen. On entering the first thing that struck me was the familiar paintings that Els' photographed. I had an enjoyable but swift walk around before heading off. Originally I had planned to visit a few more, but our tolerance for the Mexican road system had run out, so rather than spending another day fighting against road signs and speed bumps we stayed on the autopista and whipped through to Puebla, enjoying views of the base of a gently erupting Popocatépetl. An enjoyable WHS that helped illustrate the story of how European religious practices were introduced and adapted in the 'New World'. The description of this site’s 14 monasteries as being “on the slopes of Popocatapetl” demonstrates a considerable degree of poetic license! Only 4 could, by the wildest stretch of imagination, be said to be literally on that volcano’s “slopes” and many are quite a long distance away! Nevertheless the buildings have their interests as representing the very earliest stages of the “Christianisation” embarked upon by the Spaniards in the years immediately following the “Conquest” of Mexico in 1521. Only 2 years later the Franciscans established the first of these monasteries in Cuernavaca – the rest followed within the next 50 years. So most are large, fortified structures (photo 1) reflecting, in a number of ways, the times in which they were built. The first problem for anyone wanting to visit is to establish EXACTLY which monasteries got inscribed!! The ICOMOS evaluation lists 14 (11 in Morelos and 3 in Puebla states – generally west and east of Popocatapetl respectively) but recommends that the entire nomination should be deferred and that the “states party” should be invited to “consider the omission of Hueyapan (and also Cuernavaca if assurances cannot be given that recent constructions will be removed)”. Today (March 2008) the UNESCO Web site states “These 14 monasteries……” but then only lists 13 – the original list less Hueyapan! 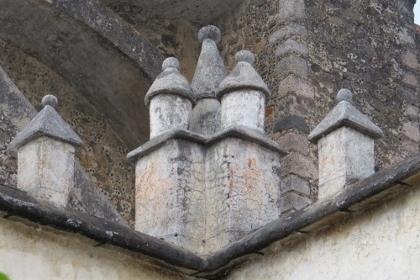 A further complexity is that the ICOMOS evaluation clearly believes that it is including the monastery at Oaxtepec (an important site as it was the first monastery established by the Dominicans in 1528) – even though it doesn’t include it in its list! Now, in common with the previous reviewer, we went to Oaxtepec and I can confirm that it has a nice brass plate with its name on confirming that it IS inscribed! So it looks as if the 14 consist of the original ICOMOS list less Hueyapan plus Oaxtepec and that the UNESCO Web site has missed out the latter. I can find no reference in any minutes that the Inscription was made on the condition that Hueyacan was removed but it does seem to have been. It seems also that the “problem” with Cuernavaca was solved or quietly forgotten. Mexico appears to be trying to ensure that the capital cities of its various states each has a WHS, hence the rather large number of relatively mediocre “Colonial centres” which have made it to the list – Cuernavaca’s centre certainly wouldn’t qualify, but its Cathedral (upgraded from the earliest monastery) is rather fine – albeit not enough for a “single” nomination. During the 1990s, under the direction of its liberal Bishop Luis Cervantes, it was “furnished”/decorated in an uncompromisingly bare “modernist” style. I personally found it quite successful and the murals discovered during the restoration have also been preserved. It is difficult to recommend which Monasteries are the most worthwhile. It depends on what you are most interested in - the previous reviewer was clearly concerned with the quality of the frescoes. Perhaps we were more interested in general “atmosphere”. 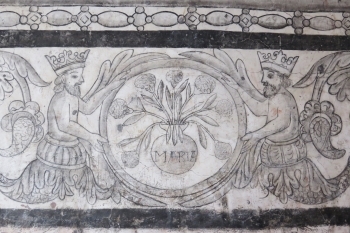 Maybe history has treated each of them differently in terms of how well their frescoes (and their exterior decoration) have survived but all of the churches we visited were “well cared for” in the sense of being “in use” by the locals as living churches. We were there during the week before Semana Santa (Holy Week) and one of the nicest things was to see the locals preparing for the “celebrations”. Some of the villages in which these churches are situated are still very “indigeno” and the crosses upon which locals would enact the crucifixion (with scourging – but I think that real nails are only used now in the Philippines?) were being lined up. In Tetela a huge wooden pole had been erected in the churchyard for the “Voladores” to perform their pre-Hispanic pagan ritual. They had probably been doing this ever since the Spaniards built the church, possibly on the site of a pre-Christian religious structure, in a ceremony which, no doubt, propitiated the old gods as well! Unfortunately we were not staying for the Festival. We saw “touristy “Voladores” at El Tajin (they also perform near the Anthropological Museum in Mexico DF) but it would have been wonderful to see a “genuine” local performance! Tepotzlan is the largest of the “villages”/towns (other than Cuernavaca of course) and its monastery is well set up for tourists – with even a “gift shop” and the only one we saw other tourists at. The murals in the cloisters were well preserved with wonderful depictions of shaven headed, fat friars (Photo 2) – somewhat threateningly carrying a Cross to the unbelievers!! The town generally is also well worth a visit. Huejotzingo felt to us the most “medieval” – a huge fortified structure with an enormous “Atrium”. This open air chapel was unknown in European church architecture but was standard here in these early Mexican churches and was designed to accommodate the hundreds of indigenous worshippers outside the church itself. 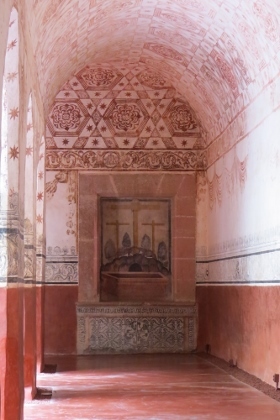 In each corner is a small chapel or “Posa” where rituals could be carried out. The church is unashamedly “Gothic” moving towards Renaissance – this was still potentially dangerous frontier country so no namby-pamby Baroque here yet! The church is on land raised above the surrounding town – probably the flattened remains of a pre-Hispanic pyramid. This church alone has preserved its 16th century wooden altarpiece. These 3 would give you a reasonable feeling for the architecture and the history of Christian expansion in those early days, but I wouldn’t advise against taking in any of others you have time for. 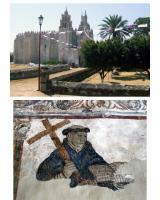 5) Santo Domingo de Guzmán in Hueyapan: This is in the worst state. I couldn't even enter because it was really early, for what I saw from the outside it has been painted in pastel colors! 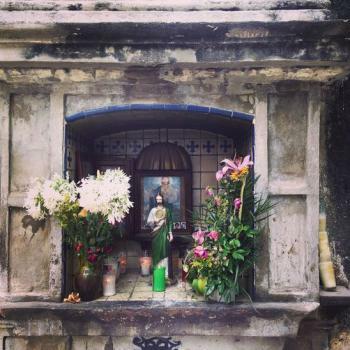 6) San Guillermo in Totolapan: I almost cried when I saw it. The upper floor has been remodelated to serve as rooms for he priests so all the frescoes are lost. Has been on T List since 1986 as "16th C Convents in State of Morelos"